It’s the Halloween version of the May basket—neighbors leave one another anonymous goody bags in celebration of the holiday. The receivers then secretly Boo other neighbors (but not the houses with the ghost on the door—they have already been hit). Want to join in the excitement this year? Use these simple tips to start a Halloween boo game in your neighborhood. Get creative and pen your own verse, or choose one of these exclusive Hallmark poems that we unearthed from our archives. Then pick up some spooky paper and use your most frightening handwriting—in heavy black ink, of course! If you’re writing your own Boo, remember, not all poems rhyme, and as long as it comes from the heart, it’s a guaranteed winner! and a great big BOO! Everyone loves a good snack mix, and it couldn’t be easier to make! We made two: a spicy one for the grown-ups (it was a huge hit at parties and work) and a sweet, kid-friendly one. All you need to do is pick up the ingredients and toss them together. 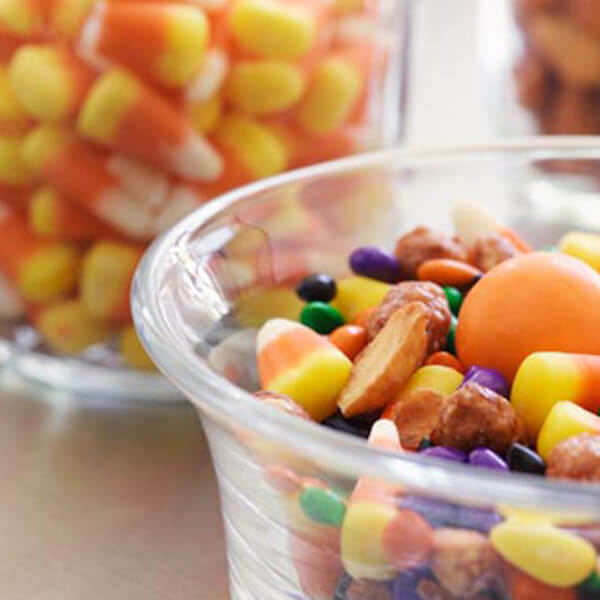 Parents, take note: If you’re going to Boo using a homemade mix or candy that isn’t individually wrapped, it might be a good idea to let the adults on the other end know, so that parents know their kids can dig in safely. Express your Boo bag personality (but keep your identity a secret) by creating custom surprise elements. Have your kids design and color a small label that says “Terrifying Treats” or “Spooky Snacks” or check out these fun (and free!) You’ve Been Boo-ed printables from our friends at Think.Make.Share. Tie the bags with festive ribbons or add Halloween ornaments for a creative touch. Pick out a house and sneak up close. (Make sure its windows have no ghost that tells you clearly “We’ve been Boo’d!” It’s best to visit someplace new.) Hang the treats on the doorknob, ring the bell, and then run! Once they get your poem and yummy food, they’ll know for sure that they’ve been Boo’d!